Santo Makoi is a political refugee from South Sudan. He studied fine arts at Sudan University in the north of the country before the south became independent in 2011. He worked for a European NGO called War Child, teaching refugee children to draw and paint. Santo, who is a gifted painter, studied fine arts at Sudan University before north and south separated in 2011. 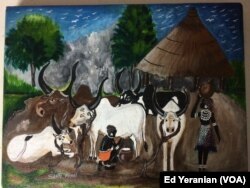 This picture of village life in south Sudan is one of his favorites.